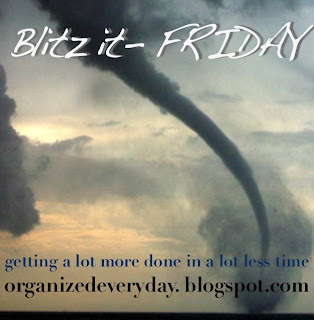 Organized Everyday is hosting a new carnival called Blitz-it Friday. If you have no idea what a blitz is, check out the original one hour blitz and staying focused. Although my kitchen, living room and dining room could use a blitz every week, today I decided I really needed to tackle another area of the house ... my bedroom. Here are a few before pictures. Where do you start, when the piles are so high? In order to keep from getting discouraged, I had to start with the easiest stuff and the piles that would make the most visual difference. Here is how I tackled this space. Empty Boxes - why are these in here anyway? Random Boxes - these are boxes and containers that had been used to quickly pick up other parts of the house before company came over... then they just sat in my room making a mess. Surfaces - I cleared off the top of the desk, the dresser, the headboard and the night stands. This was time consuming because there are so many little things - jewelry, hair clips, paper clips, safety pins, etc. Put Away Piles - I had created several piles of stuff that went to other rooms that had to be put away - kid's room, garage sale stuff, etc. The timer went off right before I started this and it took me 10 minutes to get it all distributed. It is still not perfect, but it is so much better. In the end, it took me 70 minutes to get the bedroom to this point. Check out the after pictures. Yes, I know we need to hang some pictures on the walls, but we are moving soon, so it will probably never happen. This month, I was inspired by the Monthly Organizing Round-Up at Organizing Junkie. For the month of April, it was all about a closet or cupboard. I had to tackle the entryway closet. This closet degrades into chaos so quickly, but this time I tried to set up a few systems that would help slow the mess. Back in February, I installed a new system for holding our winter hats and scarves. You can see the shoe holder hanging on the back of the door. It has worked well for us these last few months. And now that sunny weather is here, our sun hats and sun screen have found pockets here, too. Before the big purge, the coats were crowded overflowing; the bottom was stacked with fallen coats, food, picnic stuff, paper recycling and who know what else; the top shelf was stuffed with bags and everything random you can think of. Here is the closet last week before I started cleaning. I had to clean this closet in small steps. I could only make a mess that could be cleaned before the kids got up from their afternoon naps. I started by pulling everything out that had been stacked on the floor of the closet. I tried to put things in general piles as I pulled them out, to make the sorting a little easier. I then spent the next hour sorting, putting things where they go and finally putting a few things back in the closet. What a mess! I could not believe all that had been on the closet floor. The next step was to clear out the the top shelf. There was some weird stuff up there - far too many empty paper bags, some empty boxes, a long lost brownie mix, more winter hats, etc. Again, after pulling everything out, it was the same sorting and tossing process. A few days later, I pulled out all the coats for sorting. Some were stored for next winter, some given away and some put back in the closet for cool summer nights. Here is the after picture. It may not look that different, but it really is! Check out more great closet organization at Organizing Junkie. Yes, Easter Pictures ... sorry these are so late! On Easter Sunday, we organized a little bit of fun for everyone in our building who had no other plans for this day. We started with an Easter Egg Hunt for all the little kids. It was a little chilly, but the kids had fun. Joshua and Abigail loved searching the bushes for little eggs. Here is Abigail checking out her 'loot'. Joshua found a few colorful eggs among the beautiful flowers. After the egg hunt, we headed inside (not our apartment) for a wonderful turkey dinner - sorry no inside pictures! We also didn't get any cute outfits for the kids this year, and didn't remember to take any "church-clothes" pictures. My son loves scissors. He loves cutting paper. See that look of concentration on his face!? Although he is definitely right handed, we practice cutting with his left hand as well to strengthen all those little muscles in both hands. This exercise helps develop fine motor skills, works his eye-hand coordination and gives my son confidence in his own abilities. For those of you who haven't read it at his blog, Darren has posted his Reflections On A Seminary Education. Check it out! Cast your burden on the LORD, and he will sustain you; he will never permit the righteous to be moved." Do you ever feel like running away, even just for a little while, to escape it all? Sometimes I hide in the bathroom for a few minutes, just for a little break from the kids, the noise, the house. But what I really need is a long-term solution. I am slowly learning how to find refuge in my God. I know he is my strength and my hiding place, but I struggle with the practical application of this truth in my life. How do I practice this on a daily basis, so I am not worn down by the cares of life? How do you find refuge in God? What ‘rubber-meets-the-road’ solutions do you use in your life to “hide in the shadow of his wings”? Some days I feel so overwhelmed and wish I could escape it all. Today, I cast my burden on you, and I pray that you will sustain me through this. I lean on you for strength. Thank you for being my escape. I rest in your peace, keeping my mind steadfast on you. This was a great week for our meal planning. Because I knew exactly what I was doing for dinner each night, I was able to have everything ready in advance and quickly pull it together when everyone was hungry. I was so excited to have the extra time with the kids outside. Planning ahead can be so wonderful. For the kids, we did pretty well adding raw veggies to our meals. I want to keep working it this week. Maybe some fun 'dips' will help - hummus, catchup, ranch, etc. raw veggies - broccoli, carrots, etc. Check out more menu plan's at Organizing Junkie. The timer went off just after I started the bathroom. I'm not sure how long it took, but I was able to finish it before my kids went crazy. Whew! I'm tired just thinking about it. I started to lose my momentum about 45 minutes into the cleaning. A couple big gulps of water helped get me going again. How do you tackle your cleaning? I picked up two silly hats at a thrift store for the kids to use in dress-up! Abigail has recently learned how to put on her own hat. Now we just need Joshua to learn how to share! Cleaning Our Closets ... again! This week I am focusing on cleaning out our closets ... again. We do this every spring and fall, as the seasons change. And I am inspired to get this done before the PTS community clothing exchange this coming weekend. A few days ago, I spent several hours working on the kid's closet. We filled five garbage-size bags of clothes to donate to the clothing exchange. At least two of the bags are full of summer clothes from last year that I was saving for the spring exchange. Sometimes I wonder how these kids end up with so many clothes. But it is not something I am going to complain about. I am so thankful for all the hand me downs from friends and family that keep my kids well clothed throughout the year! I'm not sure if I will have time to clean out my own clothes by tomorrow, but that is my goal. Either way, I am very pleased with all that we got done this week. I know many of you are wondering what we are doing next year. There has been so much talk about all the different options that are open to us. I thought I'd take this chance to give a little update. Darren applied to four PhD programs for next year, but was not accepted to any of them. He applied to extremely competitive schools, and the economy impacted the openings as well (for example, PTS normally accepts 20+ PhD students each year, but this year they only had the budget for 11 students). Our "back-up" plan has always been to apply for the Theology Master program (a one-year degree) at a few schools, but preferably staying at Princeton. However, Darren has been strongly advised to go to a different school to strengthen his application and expand his experience. On this advise, Darren has applied to the University of Edinburgh and the University of Aberdeen (both in Scotland), in addition to Princeton Theological Seminary - all for a one-year Theology degree. Our first choice is the University of Aberdeen. Darren would get to do a year-long research thesis with John Webster (a theologian he has long admired). So, Scotland is most likely our destination for school next year, but we are currently in a holding pattern. We expect to hear from Edinburgh in the beginning of May, but it could be the end of May before we hear from Aberdeen and PTS. We will let you know once we know anything else! Thanks for your prayers for peace and patience, for wisdom and guidance! Check out the other posts in this series. After reflecting on solitude, we next move to the topic of Silence in the life of the Desert Fathers. I found myself struggling against the idea of silence and my attitude about it. The Desert Fathers' ideas of silence seem too extreme, too impractical. But after contemplating the many points Nouwen made in this chapter, I am left with the conviction that I need to practice more silence in my life. In our society, silence has become something uncomfortable, almost to be feared. I remember a co-worker at my first job in high school. She was a few years older than me and a cheerful, chatty person. One day she got upset at something someone said to her and she decided to spend the day in silence. We later talked about this day and she shared how uncomfortable her silence had been. She was stuck with her own thoughts, with no place to hide, no distraction. Our culture does not see silence as a virtue. "We have become so contaminated by our wordy world that we hold to the deceptive opinion that our words are more important that our silence." We are encouraged to “share” with each other and taught that sharing our feelings, emotions and thoughts is the true virtue. "...we have become inundated by a torrent of words... [they] have lost their creative power. Their limitless multiplication has made us lose confidence in words and caused us to think... 'They are just words.'" As the chapter concludes, Nouwen gives us great perspective on how silence can be applied to our daily lives. "Let us not be too literal about silence. After all, silence of the heart is much more important that silence of the mouth." Abba Poemen said: "A man may seem to be silent, but if his heart is condemning others, he is babbling ceaselessly." "Love, not silence, is the purpose of the spiritual life and of ministry." All quotes are from The Way of the Heart, chapter 2 – Silence. The weather finally cleared up around here for a few days and we spent some great time playing outside. Joshua loves to march around in his rain boots. Abigail has been exploring all the riding toys at the playground. She loves the motorcycle. Here is Joshua enjoying the rocking horse. Abigail has recently discovered how fun the sand box can be. Joshua is currently excited about all transportation and everything with wheels. Abigail has found basket balls to be a little challenging - big and heavy! But she is so excited when she gets one in her arms to throw it. I can't wait for warm, summer days and lots of play time outside! Joshua has been inspired by yet another Eric Carle book - "Today Is Monday." All you hungry children, come and eat it up! Now every visit to the sand box includes sampling Joshua's culinary creations. His favorites are string beans and roast beef! Here is Joshua in the sand box, carrying a plate of "food" fresh from the oven. "What do you have there, Joshua?" I asked him. "String Beans!" he excitedly shouts back. Here is daddy, eagerly consuming the delicious beans. Now we just need to teach Abigail that we only pretend-eat the sand food! 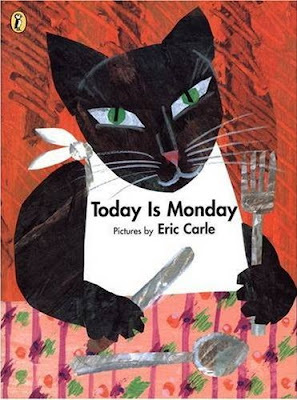 We have a new favorite book in our house - "Today Is Monday" by Eric Carle. The culinary text is based on a well-known children's song about food and the days of the week. Eric Carle uses his wonderful portrayal of colorful, exotic animals to bring these foods to life. Each day has a food. "Monday, string beans" reveals a large, blue porcupine chewing on string beans, with several stray beans stuck in its quills. "Tuesday, spaghetti" pictures a beautiful, green snake struggling with a page full of slippery spaghetti noodles. And so on. My son loves this book because of the colorful animals eating silly foods. I, also, enjoy the animals and the food, but I love this book for many other reasons. First, it has sparked my son's imagination in exciting new ways. We have worked with my son's speech therapist for a year trying to create situations to stretch his imaginative play, with the knowledge that this was stalling his progress in speech development. Enter this book into the scene (along with other factors, of coarse) and he becomes so excited about "cooking" in the sand box. Now every time we go out to play, he is constantly making food for us to try. And what does he make? Some yummy creation mentioned in this book. His current favorite is roast beef. What wonderfully, imaginative play! Second, this book has enticed my son to try the foods the animals are eating. He now happily eats green beans ... if I call them string beans and mention how the porcupine likes them. And he willingly tried roast beef because the tabby cat had some. For a kid who has serious feeding issues (and was under the care of the Children's Hospital of Philadelphia's Feeding Team for a year), this is a huge help to us, the feeders! Third, our three-year-old has learned all the days of the week and loves to talk about what day it is today and what day comes next. And it encourages his love for reading! Last week was crazy and we only made one meal off the menu. I was out of commission (migraines) for the first few days and we ended up with two dinner invitations toward the end of the week. So, most everything will be repeated from last week. We still haven't gotten any where with the bread, so I am going to set aside that goal for now. This week we are going to try raw veggies (the kids normally want everything cooked and squishy). Maybe some fun 'dips' will help - hummus, catchup, ranch, etc. "I will bring the blind by a way they did not know; I will lead them in paths they have not known. I will make darkness light before them, and crooked places straight." As a family, we are in just such a time described in this verse; I feel like a blind person wandering on a crooked road that is unknown to me. I need the light and the straight paths a fore mentioned. My husband graduates with his M.Div. degree in May. We were hoping to be heading somewhere (or staying here at Princeton Theological Seminary) for a Ph.D. program, but did not get accepted to any schools. Originally, we talked about just staying at PTS another year for a Th.M. degree, and applying again next year. But with the economic changes, PhD programs are becoming more competitive and my husband needs to be more aggressive about making his application stand out next year, which means looking at other schools that could provide a bigger impact on his application. So, the applications have gone out to several other schools for one-year, Th.M. programs. And now we wait! In a few months, school ends and we have to move ... but to where? Yup, very curvy roads; can't see around the next bend. But God has promised to lead, to bring light, to make paths straight. Thank you for your promise of light and wisdom. Teach me to focus on you alone during this time of "blindness." Make the darkness light before me, and my crooked places straight. Remind me to see you for the answers, and rest in your peace while we wait. Friday was the Trike-A-Thon at Joshua's school. Every year they raise money for St. Jude's Children's Hospital. Here is Joshua on his trike, getting ready to start the ride around the block. Abigail and I walked around with all the kids, to help out. I just love that look of concentration on his face. He was very determined to do this all on his own. I was only allowed to help if he got stuck and when crossing the street. He was one of very few in his class who rode the entire way. He was also very tired at the end of the day. So were his little legs ... he needed help climbing the staircase to our apartment that night. This week I did two 30 minute blitz's on different days. It doesn't seem like much because it was only a few tasks, but it was a huge pile of laundry. The timer went off before I finished putting away the last load. The timer went off as I was preparing to take out the garbage. It was a great half hour. I was able to get more done than I expected. There have been a lot of rainy days lately ... Spring is here! I have been challenged keeping the kids entertained while it is too wet to go outside and play. One thing we always enjoy is BALLS! Last time I blew up their swimming pool inside for they to play with the balls, but that is a lot of work. This time, I decided to pull out the baby bathtub and a big storage container. The kids loved it! Balls, balls, everywhere! I am always looking for new ways to work with my son on his gross motor strength. Balancing on one foot is great for working his core muscles. But he is not strong enough to do it on his own and is easily frustrated. Here is my inspired idea this week. We filled an empty bottle with water (and a little food coloring for excitement). Then he stood with one foot on the bottle. It provided just enough balance to keep him from giving up, but was still wobbly enough to require he really work those muscles! What do you do to encourage your little kids in their gross motor development? Abigail has gotten excited about helping mommy in the kitchen. Most of the time, she likes to load the dishwasher, more than unloading. I never know what interesting things I might find in there when she is done. I repeatedly need to be reminded to STOP and bask in the presence of God. It seems that life continues to get busier, and I lose perspective so quickly. I almost feel at times that I don't even know how to stop. The idea of contemplation is so appealing to me, and I can force myself to physically spend time in prayer and in scripture everyday. But I cannot physically force contemplation just by not doing things. It is a discipline of the mind. I need to discipline my mind to focus on the task at hand (prayer, scripture, meditation), and not constantly jump to the next task on my list. This is my big challenge ... to be still and to meditate in the presence of my God. Thank you that you are always faithful and will finish the work you have begun in me. I am tired of struggling, of fighting, of losing. I desperately need to listen, to "be still." I am willing, but I need your strength ... I need you. I admit that many times in the past I have asked for you guidance and wisdom, but have not remained patient waiting for you to answer. Forgive me. Help me to rest in you, to "be still." Calm my worries and fears; give me your peace. Thank you for walking beside me, behind me, before me, beneath me, above me through all the pressures of life. I submit myself to you. Transform me, in the solitude and quiet, into your image.